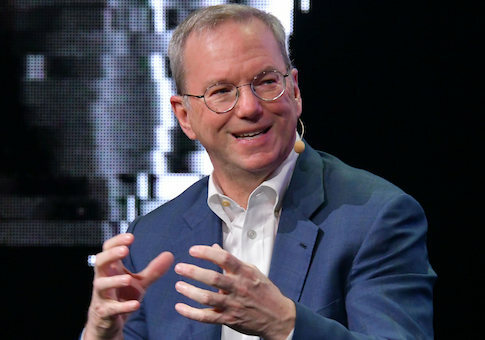 Eric Schmidt, the chief executive of Alphabet, Google’s parent company, is working directly with Hillary Clinton’s presidential campaign, according to a memo contained within an email released by WikiLeaks. "Discreet conversations" of forming "working relationships" with companies such as Facebook and Apple were also facilitated as early as October 2014, the memo stated. This is at least six months prior to when Clinton announced her candidacy for president. The document was attached to an Oct. 26, 2014 email sent from Robby Mook, now Clinton’s campaign manager, to Cheryl Mills, a longtime Clinton aide; David Plouffe, Barack Obama’s previous campaign manager; and John Podesta, Clinton’s current campaign chairman whose email account was compromised. The email was posted to Wikileaks after hackers believed to be working with the Russian government breached Podesta’s email account. Teddy Goff, now a digital strategist for the Clinton campaign who is the former digital director for Obama’s reelection campaign, wrote the memo, which was addressed to Clinton. It touched base on "Technology and digital priorities." Goff began by listing "priorities" for the Clinton digital team to undertake. In his estimation—in order of importance—these included: "Raising lots of money," "Creating and distributing excellent content, for both supportive and persuadable audiences, on social and paid media and in videos," and "Recruiting, engaging, and organizing volunteers and prospective volunteers." Goff then provided an update on these developments. Within this section, he repeatedly referenced the work "Eric Schmidt’s group" and "team" is performing. The Washington Free Beacon reported last week that John Podesta emailed Schmidt in April 2014 to set up meetings with Cheryl Mills and Robby Mook. "I have been kept apprised of the work being done by Eric Schmidt’s group and others working directly and indirectly with your team. On the whole, I am comfortable with where we stand and confident in our roadmap to launch day and beyond," Goff wrote. Goff wrote that they have selected a team of developers unaffiliated with Schmidt to build the front end of Clinton’s website. "They are apprised of what Eric is building but not dependent on it, having identified commercially available products for all mission-critical functions in the event Eric’s group is delayed or otherwise derailed," he wrote. "We have instructed Eric’s team to build the most important products in their portfolio—specifically, the back-end of the website, the ability to accept donations (along with associated features, most importantly the ability to store credit card information), and the ability to acquire email addresses—first," Goff says. "Given how much time remains between now and launch—and, again, the availability of alternative solutions—I believe there is effectively no chance that these core functionalities will not be in place in time for launch." Eric’s team is also developing products that are not, strictly speaking, critical for launch, but would be extremely useful to have as early in the cycle as possible. Chief among these is the system that consolidates data from disparate sources to allow you to develop more complete user profiles and therefore more effective programs. I shared the concern, voiced by many, that the initial scope for these products was overly ambitious and unrealistic; they have since been cut down to a much more manageable size, without sacrificing core functionalities. (Of note, many of the problems that stifled us in 2012 have since been tackled by private companies with whom we have relationships and whose tools we can license rather than attempt to replicate.) I am cautiously optimistic that the most important of these will be completed in time for launch; if they are delayed, I have no reason to believe they will not be ready shortly thereafter, long before potential challengers in either party will have been able to build anything similar. Goff concluded by speaking of the importance of the campaign forming "working relationships" with the likes of Google, Apple, Facebook, and other technology companies. "We have begun having discreet conversations with some of these companies to get a sense of their priorities for the coming cycle, but would encourage you, as soon as your technology leadership is in place, to initiate more formal discussions," he wrote. While the exact Schmidt-backed group is not named within the memo, Schmidt has provided funding to a tech startup called The Groundwork, which is paid by Hillary Clinton’s campaign. Michael Slaby, the former chief integration and innovation officer for the Obama campaign, developed The Groundwork through a company he co-founded called Timshel. Slaby has been tight-lipped about details of its partnership with the Clinton campaign. The group has been paid nearly $600,000 from Hillary for America since its inception. Google has also been accused of manipulating search results to favor Hillary Clinton earlier this year. Schmidt did not return a request for comment on the memo. Clinton’s campaign did not immediately respond to inquiries. This entry was posted in Politics and tagged 2016 Election, Google, Hillary Clinton. Bookmark the permalink.